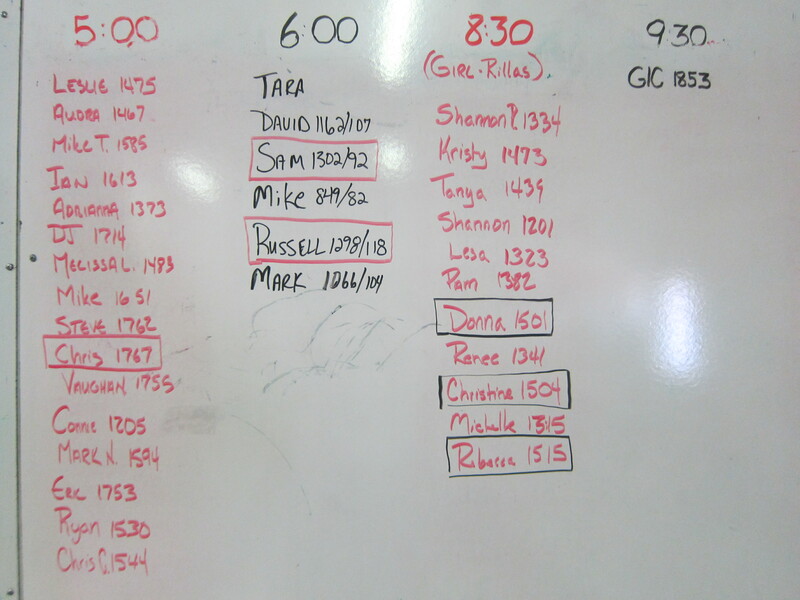 Here's the morning, check out who your chasing, the gorilla gauntlet is officially thrown down. An outstanding effort so far today. The Girl-rillas broke the 1500 barrier for the ladies, and not just one of them. Christine proves technique and practice can prevail at 1500+ meters and shortly will be celebrating her second 30th birthday. Men the next milestone is 1900, I know someone out there can do it, questions is will they show up? Thanks for the props Matt, BUT!!! the 6:00am class numbers are skewed because our numbers reflect the last Big number on the display for Calories per hour, and the second number is for the total calories burned for the WOD. There was some confusion this morning regarding this. My bad Russell, I didn’t read the fine print. GIC clearly typed it up to be meters rowed was the score. Not enough caffeinated beverages for me this morning. Buprees for punishment? Curious no one else at 930 to confirm GIC’s 1853…..suspect. Don’t get intimidated, just try your best. LOVING CROSSFIT SILVERBACK!! Thanks Matt! I never realized I LOVE lifting weights. My kids and husband see a difference in my mood. I use to complain about going to the gym and would watch the clock and maybe make 45 minutes (stretching it). Here at Silverback, I can’t wait to get there.